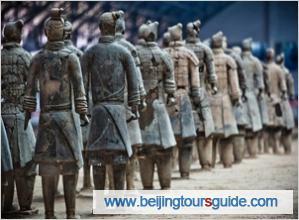 The Terra-cotta Warriors and Horses: It is one of the most significant archeological finds of the 20th century. The ‘underground army’- 6000 life-size painted terracotta warrior and horses individually sculpted from real life models and arranged in battle formation have been protecting the mausoleum of the first emperor in Chinese history- Emperor Qinshihuang for 2,200 years. Big Wild Goose Pagoda: A well-preserved ancient building which is a holy place for Buddhists. It is also regarded as the a symbol of old-line Xian. Ancient City Wall: One of the largest ancient military defensive systems in the world, similar function compared to Great Wall. * Entry or exit Xian airfare or train tickets. * If you need to prolong your stay in Xian, or arrive a few days earlier, please let us know and we’d be happy to extend your hotel bookings, or arrange additional tours for you. I would like to get a price on a private tour of the terracotta Warriers for three persons for this Sunday February 27th. We need it to be English speaking. We need to get picked up at our hotel the Shangra La Xian at 8:30 AM and we must be back to the hotel by 3:00 PM. Please let me know if you offer this, what the itinnerary would be and the price. Please reply as soon as possible as we leave for China in a few hours. I would like to make an enquiry regarding a private tour with this itinerary for 2 adults and one infant on October 1st. We would need to be picked up at the airport at 930am and return to the airport at 4pm. We are English speaking. Can you please let me know if this is possible and if so, provide me with a quote. We are two adults and wouyld like to travel Beijing – Xian. Outward – on 25 April by overnight soft sleeper Z19 in 2-berth cabin. Tour of terracotta warriors on 26 April. return Xian – Beijing on 26 April by high speed train G666 leaving Xian at 17.07 arriving Beijing the same night. Either 1st class or Business class seats. Please advise your price, method of payment, and provide any other relevant information. Our travel advisor just sent an email to you, please have a look. Thanks!